Our Ford radio codes are available 24 hours a day 7 days a week. We guarantee our radio decodes work, and its totally FREE! 1. How to show your Nissan Connect radios information on the radios display. To get the information we need to decode your radio, you will need to enter an incorrect code in 3x times. For example, enter: 1-2-3-4. The ‘Serial number’, ‘Device number’ and ‘Date’. should display on the radios display. (Please see image for reference). Please make note of this number, as you will need this number for the form on the next page. Nissan Connect Bosch systems only show the information we need on screen. You do not need to take out your radio. 1. How to show your Nissan Daewoo radios information on the radios display. it will show ‘Radio Code:’. The ‘Serial number’, ‘Part number’ and ‘Prod Date’. should display on the radios display. (Please see image for reference). Example of Nissan Clarion Radio VariantIt is quite simple to remove your Nissan radio. You will need t a flat-head screwdriver for prying the panels off the dash to Access the radio. Clarion radio removal keys are ideal for freeing the head unit from the mount. Different car radio models require differently shaped removal keys. 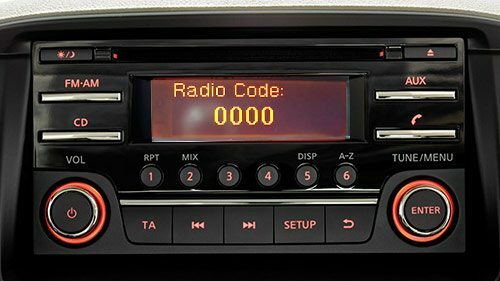 How to find your Nissan radio serial on the radios label.To find your Nissan serial number, you will need to remove the radio using radio release keys. Once the radio has been removed you will need to locate the radios label, which is on the top or side of the radios casing. When the radio is turned on ‘CODE IN’ should display on the radios display. If you have entered the code correctly on the radios display, simply press enter. If you enter your code 10 times, your radio will lock, forcing you to go to a dealer to get it unlocked.